We have set the clocks ahead, so it is officially Spring, and NEXUS has a busy season ahead with a number of exciting projects. This month began with a recording session with Sepideh Raissadat for VOA Persia. The video program is to be broadcast over Voice of America throughout Iran. Follow us on Facebook for news of the airing date. In April, NEXUS is performing with Paul Winter and the vocal ensemble Prana for the Ulster Chamber Music Series in Kingston, New York. NEXUS has some special ties with Paul Winter. 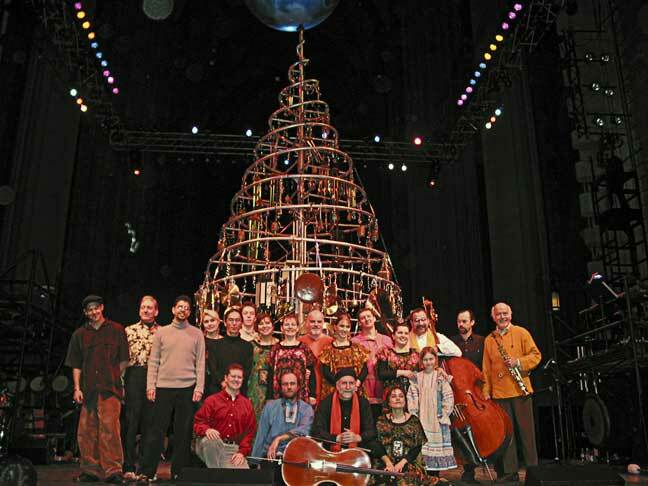 Garry created many of the chimes in the Paul Winter Consort’s revolving “Solstice Tree” musical sculpture, and Bob toured with the Paul Winter Consort as a drummer/percussionist. 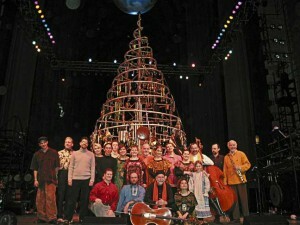 Bill often performs with the Consort and in 2006 received a GRAMMY Award as part of the Paul Winter Consort on the DVD titled, “2004 Solstice Concert.” (Above is a photo of the Solstice Tree. Paul Winter is far right, and Bill is second from left). Prana, conducted by Baird Hersey, has developed unique throat-singing techniques – using their regular singing voice rather than the low gravelly drone of Tibetan and Inuit throat-singing. You can find out more here, and you can HEAR them by coming to the concert! Tickets at the door or in advance by calling 845-340-9434. May will be The Month Of New Works! It begins with a bang on the 1st of May, at the biennial Percussion Rochester event in Eastman’s Kilbourn Hall. NEXUS has commissioned compositions from William Thomas McKinley, Michael Burritt, our own Bill Cahn, and (thanks to the John Beck Prize in Composition), the Grammy-award-winning composer Libby Larsen. The pieces are called (respectively) The Recycler, Home, This World, and DDT. All are concerned with environmental sustainability. Bill’s work is written for NEXUS with voice. Libby’s uses Rachael Carson’s classic “Silent Spring” to provide the text for DDT. We will tell you more as the rehearsals firm up these pieces – so check back for updates! June will take NEXUS to Maverick Hall in Woodstock NY, celebrating one hundred years of ground-breaking music making. NEXUS opens the Maverick’s summer-long centenary celebrations on June 27th with a Young People’s Concert in the morning, and an evening concert featuring a piece commissioned from Peter Schickele (by the Woodstock Chimes Foundation) especially for the occasion: Percussion Sonata #3: “Maverick”. Also featured on this concert will be Russell’s beautiful suite, Persian Songs, with Sepideh Raissadat’s haunting voice and beautiful Iranian setar stylings! Find out more about tickets and their other centennial events here. Follow us on Facebook for updates and behind-the-scenes peeks at all these events.